The little fishhook-shaped island is going big: a bold new brand and a new Lure Guide have recently been introduced, and a new website is on the way. First, let’s clear up a few mysteries about Bermuda, starting with where it’s located. It isn't in the Caribbean as many guess – it’s way out in the Atlantic, 600 miles east of North Carolina and almost 1,000 miles north of Puerto Rico. Bermuda isn’t near anywhere else and can’t be compared to anywhere else. Also, the temps are a bit cooler than you might imagine. Our team has learned a lot about the island. Beyond pink sand, great sailing, famous shorts and a tempting set of unofficial national drinks (the Rum Swizzle and Dark ‘n Stormy®) there are many lesser-known treasures. Otherworldly caves, blue-water grottos, a jungle and a UNESCO World Heritage Site (the Town of St. George) are just a few. You can get to Bermuda by plane, cruise ship or private boat, but you can’t rent a car when you get there – only residents are permitted to drive. Luckily, public transportation is plentiful and everything is close by. You can cross the island end-to-end in about an hour by car. Bermudians drive on the left, a sign of the island’s British heritage. Next year, Bermuda will be hosting the 35th America’s Cup, presented by Louis Vuitton, a prestigious sailing event. The Bermuda Tourism Authority wanted to step up its brand presence ahead of the high-profile global event, so it set out to reinvent the brand last year. It’s now being rolled out. 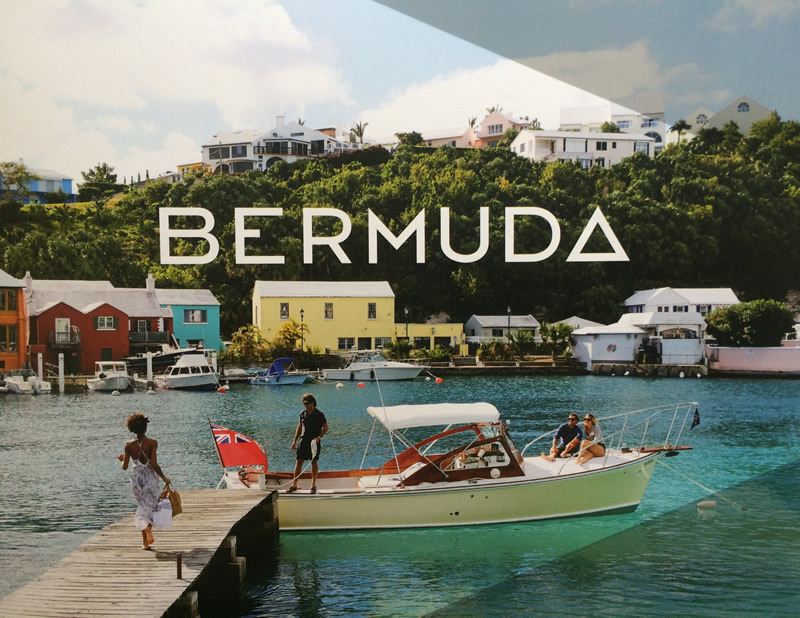 Bermuda’s new brand, developed by MMGY, is all about setting the island apart from other destinations and avoiding “the sea of sameness.” So it hooked into the legend of the Bermuda Triangle. The most obvious sign of this is in the logo, where a triangle replaces the “A” in BERMUDA. A little mystery in the information age is refreshing, as is the bold playfulness of embracing a legend that's literally about getting lost. Bermuda is going for it. Mystique is a key brand element, and the brand reinforces that life is different “out here” – the only way to know is to go. Bermuda presents a sea of possibilities, and you can stumble upon just about any type of experience, from deep sea fishing, shipwreck diving, flyboarding and cliff jumping to cycling an oceanfront railway trail or sampling the traditional codfish breakfast. In terms of the look, the color palette is less pink and more navy. Photo spreads often use angular design treatments inspired by the triangle. Branded copy is playful and smart, invoking the Bermuda Triangle with talk of “disappearing” (albeit temporarily) from the daily grind and asserting there are “three sides to every story.” The photography shows off the island’s eye-catching scenery and breezy yet sophisticated style. Miles worked with the BTA to publish the destination’s newest print product, released earlier this year. The Lure Guide was intended to be an interim replacement for the current visitors guide and was one of the first products created under the new brand. The Lure Guide is unique in both size and shape – the landscape orientation lends itself to dramatic panoramic-style images, and its smaller size (measuring roughly 9” x 7”) fits just right in your hands. The cover is soft, smooth and touchable thanks to a satin aqueous coating, and a spot-gloss UV accentuates the triangle in a sleek, subtle way. For the cover, we skipped the traditional beach shot in favor of an alluring image that captures the boating lifestyle and the beginning of an adventure. Inside, rich content covers pink-sand beaches, oceanfront golf, food culture, festivals and island hideaways. There are also regional overviews, a feature on free things to do, an island-wide itinerary and a colorful chart detailing adventures for every season. Like the island itself, the guide is a small space packed with a surprising diversity of experiences. Next up is the launch of the highly anticipated new website, GoToBermuda.com. The BTA hired Miles to perform content strategy, design and development. The site will be rolled out in phases, with the initial launch slated for later this summer. I’ll cover the features and innovations in a future blog post. Content Director Melissa Bartalos has been a part of the Miles team for more than nine years. At work, she’s responsible for creating content that informs and inspires readers across a variety of platforms. Outside of the office, she’s always up for a new travel adventure or cross-country road trip. Favorite spots (so far!) include The Florida Keys, the Smokey Mountains, Arizona and California.